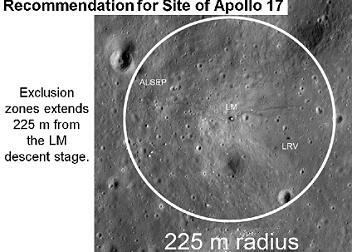 As NASA’s Lunar Reconnaissance Orbiter (LRO) produced the sharpest images ever taken from space of the Apollo 12, 14 and 17 landing sites, NASA managers are working on internal plans to protect the “heritage sites” from potential damage from future visiting spacecraft – such as the Google Lunar X PRIZE (GLXP) vehicles – listing a long set of recommendations on keep-out zones. The amazing LRO images – now released by NASA – show details which even include the actual footprint paths made when the astronauts explored the lunar surface during the Apollo missions. 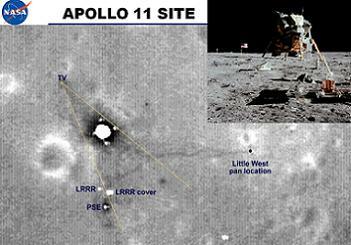 Other easily identifiable areas – such as in the Apollo 17 site – include the tracks laid down by the lunar rover, along with the last foot trails left on the moon. 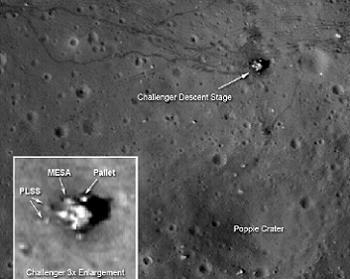 At each site, trails also run to the west of the landers, where the astronauts placed the Apollo Lunar Surface Experiments Package (ALSEP) to monitor the moon’s environment and interior. LRO – which was built and managed by NASA’s Goddard Space Flight Center – managed to take the higher resolution photos via adjustments made to the spacecraft’s orbit, which is slightly oval-shaped or elliptical. The maneuver lowered LRO from its usual altitude of approximately 31 miles (50 kilometers) to an altitude that dipped as low as nearly 13 miles (21 kilometers) as it passed over the moon’s surface. The spacecraft remained in this orbit for 28 days, long enough for the moon to completely rotate. This allowed for full coverage of the surface by the LROC’s Wide Angle Camera on the spacecraft. The cycle ended on Tuesday, resulting in the spacecraft returning to its 31-mile orbit around the Moon. “These images remind us of our fantastic Apollo history and beckon us to continue to move forward in exploration of our solar system,” said Jim Green, director of the Planetary Science Division at NASA Headquarters in Washington. The amazing images were published just days ahead of the Delta II mission to launch GRAIL (Gravity Recovery and Interior Laboratory) – twin lunar satellites – to the Moon on Thursday, which lift-off scheduled for 8:37am Eastern from Cape Canaveral Air Force Station (CCAFS). The images also arrived shortly after an expansive internal NASA presentation – available on L2 – was debated at a NASA Staff Senior meeting in August, which discussed the protection of the heritage sites from future landers and robotic vehicles. Such new arrivals in the near future include private robotic landers, such as those competing for the Google Lunar X PRIZE (GLXP) – as heavily referenced in the associated NASA presentation. The GLXP has a prize fund of $30 million available to the first privately funded teams to safely land a robot on the surface of the Moon, have that robot travel 500 meters over the lunar surface, and send video, images and data back to the Earth. There are currently 29 teams working on winning the GLXP, with $20 million on offer for the winner. 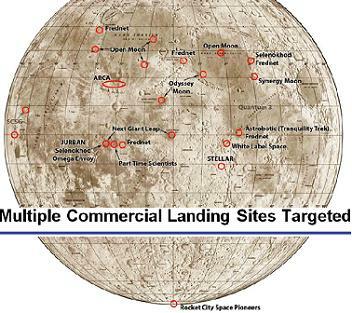 The targeted landing sites for these teams are located all around the lunar surface. According to the NASA presentation there is scientific interest in robotic visits to the Apollo sites, allowing for the collection of data on items such as dust transportations, Micrometeorite bombardment rates, sandblasting effects, the survival of microbes and Lunar Weathering. “To characterize the effects on engineered materials following four decades of exposure to the lunar environment,” the presentation noted on the latter scientific item of interest. However, there is a concern relating to the possible mechanisms of damage to the aforementioned “scientifically interesting data” as NASA worded it. Fears include the proximity of landing, liftoff and flyover from a future landing/robotic vehicle, where rocket thrust may erase footprints and treads, sandblast nearby hardware and cause deposition of chemicals/dust. 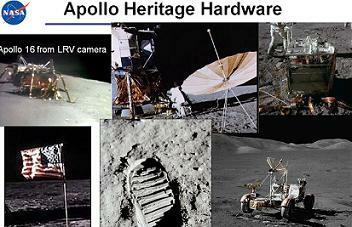 There are also concerns relating to robotic rovers accidentally running over the footprints created by Apollo astronauts, or contaminate a site via physical contact with heritage hardware. 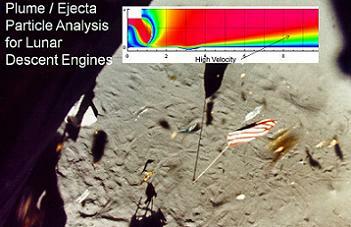 Some data is already at hand via the actual Apollo missions, such as the “Plume/Ejecta particle analysis for Lunar Descent Engines” findings, which show the descent engines create a high velocity of horizontal flow across the lunar surface. 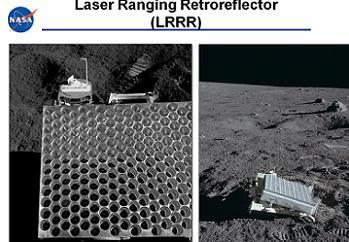 As such, NASA created a set of recommendations for preserving/protecting the USG Lunar Artifacts, relating to three categories, ranging from the six Apollo sites, the unmanned soft-landing sites of Surveyor and Luna, and through to the impact/crash sites of Ranger and the expended S-IVB stages. Among the recommendations cited in the presentation, the arrival of future craft – such as the GLXP vehicles – should follow certain flight rules, in order to provide protection for the heritage sites. The recommendations add additional emphasis for the Apollo 11 and Apollo 17 sites, making reference to a “Keepout Zone”. “While all the Apollo sites represent significant historical/heritage value in the material culture, the Apollo 11 and 17 landing sites carry special significance,” added the presentation. “It is recommended that the sites for Apollo 11 and 17 be treated as unique by prohibiting visits to any part of the site (and) that all vehicles remain beyond the boundaries of the entire site. The exclusion zone for Apollo 11’s site will result in a keep-out zone of 75 meters from the lunar module descent stage, where as the zone will extend 200-225 meters from the Apollo 17 site. However, for the Apollo 12, 14, 15 and 16 sites, more access should be provided to individual components and artifacts, NASA added, allowing for future robotic missions to get within touching distance of Apollo hardware – as much as they won’t be allowed physical contact. 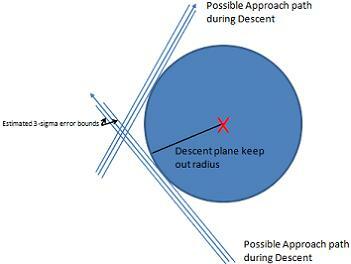 This additional access is shown as buffer zones, with a three meter buffer for descent stages, one meter buffer distance for the Lunar Rovers, experiments, sampling sites and flags, while no restrictions are recommended on the footprints and rover tracks outside the identified keep-out zones. These buffer zones will also apply to other spacecraft, such as a one meter buffer around all Surveyor spacecraft hardware. A ruling is also provided for the expended S-IVB stage impact site. An additional note on the restrictions at the Apollo 12, 14-16 sites, is also listed, relating to the Laser Ranging Retro-Reflectors (LRRRs), which the presentation notes should be carefully preserved. “The LRRRs should be treated as special cases with approach mobility being tangential to the site. Once within a 10 meter radius zone of the LRRR, mobility can only proceed at speeds that do not propel regolith particles forward of the rover up to the total exclusion zone of one meter radius around the retro-reflector. Several pages of additional rules and allowances are listed for landers in the hopper configuration, along with the potential that the GLXP missions may provide additional science opportunities and data to use in refining their rulings. As such, NASA class the recommendations as an evolving document, based on early, small landers with imaging only. Such lander capabilities are likely to advance over the short-term. Forward work will also include analysis on rocket exhaust interaction with the lunar regolith to attempt to reduce the D/L distance. (As the shuttle fleet retire, NSF and L2 are providing full transition level coverage, available no where else on the internet, from Orion and SLS to ISS and COTS/CRS/CCDEV, to European and Russian vehicles.